Baby boomers aged 65 and older have no sway on the affordability of housing in major markets like San Francisco, Los Angeles, Miami or New York City, according to a new study by Trulia, published Thursday. The conclusion — that seniors face the same affordability issues and rising rental rates as younger city dwellers — runs counter to arguments that seniors are depriving the housing market of precious supply by refusing to downsize. In the 100 largest U.S. markets, there is “no evidence that boomers holding on to inventory is eroding affordability,” said Trulia Housing Data Analyst Alexandra Lee in the report. The markets where seniors have best and worst downsizing potential. 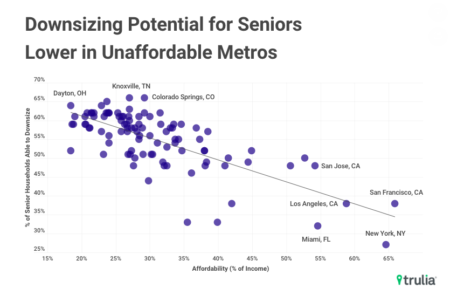 The downsizing potential for seniors in the most expensive markets is dismal — in New York City, only 27 percent of seniors have the ability to afford a single-family home on their own, since a median mortgage payment would require 64.6 percent of their income. Seniors in San Francisco are finding themselves in a similar situation. Only 38 percent of residents aged 65 and over have the ability to afford a single-family home on their own, and the median mortgage payment would require 65.9 percent of their income. On the other hand, seniors in the most affordable markets, where inventory shortages aren’t so dire, have the best downsizing potential. Dayton, Ohio; Knoxville, Tenn.; and Colorado Springs, Colo. were designated as best markets for downsizing seniors, since nearly 70 percent of the population aged 65 and over are able to afford a single-family home without the financial help of their children or grandchildren. In the face of dwindling downsizing potential due to higher housing and overall living costs, oldest baby boomers have begun to stay in the workforce longer, live in multigenerational households more often and are delaying downsizing by at least five years. In 2016, 19.3 percent of baby boomers 65 and over were still working — a 3.4 percentage point increase from 2005. Fewer of them live alone (85.2 percent in 2005 versus 83.4 percent in 2016) and they’re also more likely to live with younger family members (14.4 percent in 2005 versus 16.1 percent in 2016). Although a sell-off could happen in the near future, Trulia says, it’s still going to take more than that to provide better housing options for younger generations. “Gen X-ers and millennials, especially in expensive coastal metros, are going to need more than downsizing boomers to alleviate the inventory crunch they are facing,” Lee said in the report. Trulia used 2005 and 2016 5-Year American Community Survey data for labor rates, household generation composition, moving rates, unit structure type, number of bedrooms, and tenure. The analysis only looks at households that are not in “group quarters,” which would include retirement homes and nursing facilities. This means that the downsizing estimates are likely understated. Affordability is based on Trulia inventory metrics from the second quarter of 2018, defined as the share of the median income needed to purchase the median priced home.